Here at Bruce Courtney, DMD we are excited about some new faces at the office! All of our staff is seasoned and well experienced so you can relax and know that you will be taken care of with caring and dedicated team members. Our team makes going to the dentist a great experience! Nancy is the first person who will greet you as you walk in the door. She has over 35 years experience as both a Dental Assistant and a dental office manager. She will happily assist you in checking in and out, scheduling appointments, and processing your dental insurance claims. Nancy has a certificate in dental assisting and a B.S. degree in Sociology. She'll make your feel right at home! Cindy has for over 22 years as a Dental Hygienist, 17 of those years with Dr. Courtney. She is a graduate of New Hampshire Technical Institute. Her three sons have kept her on her toes so treating your children is second nature to her! Cindy's vast experience and concern for her patients are greatly appreciated by those she treats. Christine has 28 years experience as a Dental Hygienist. She is a graduate of New Hampshire Technical Institute with an Associates Degree in Science. She adds a sense of flair to the team! Her energetic personality and years of dental experience help patients feel at ease. 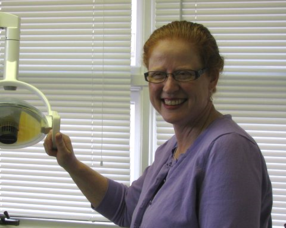 ​Lynne has been a Dental Hygienist for 33 years and has worked with Dr. Courtney for 18 of them. She graduated from Hudson Valley Community College with an Associates Degree in Science. Lynne loves to laugh and will make you feel comfortable instantly. Kim graduated from New Hampshire Technical Institute in 1988 after 6 years active duty in the Navy. She continued to serve another 17 years in the Naval Reserves. We appreciate her service to our country and her dedication to our patients! You won't leave her chair without a grin on your face.